Brinjal Masala is a delicious dish that pairs well with Rotis. Brinjal, known in many names such as Eggplant, Aubergine, Baingan, Vazhuthananga, was not one of my favourite vegetables when I was growing up. But after marriage and some health / lifestyle changes, this vegetable occasionally started appearing in our menu to have with chappathis. Until now, it is still not included in the desirable food list by my kids (can’t blame them! 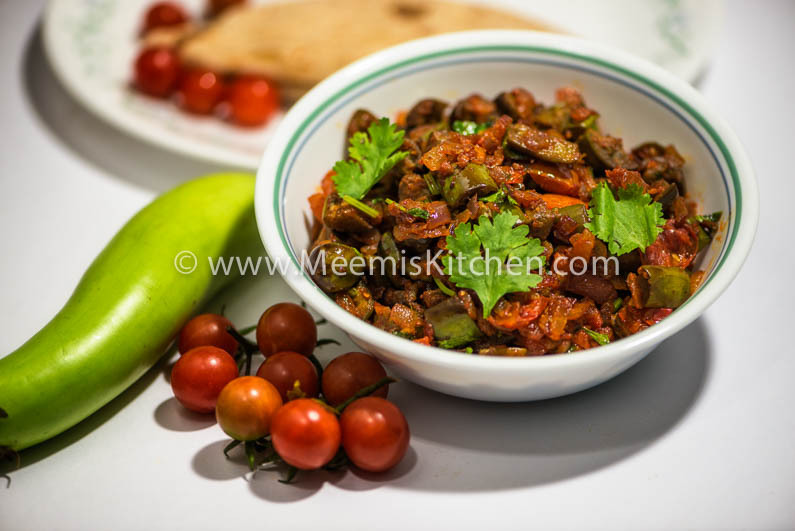 ), but, This Brinjal Masala is best served with Rotis. Check my Brinjal Curry which is great with rice and rotis. If you are looking for Vegetarian options, try Vendakka Mappas, Bhindi Masala, Aloo Gobi Masala, Rajma curry, Paneer dishes like Butter Paneer, Paneer Korma, Palak Paneer, Matar Paneer, Chili Paneer, Gobi Manchurian with Rotis. Well, when I got some farm fresh green Brinjals from Manoj’s farm (my cousin), thought of making this for dinner. I have used some farm fresh cherry tomatoes in this and it tasted just awesome. Nothing like organic veggies!! So, to all my vegetarian friends, hope you all like this simple Brinjal Masala recipe like my Paneer dishes and other Thorans. Enjoy!! Prep. Time : 10 mts. Wash and cut the Brinjal into small cubes. Chop onions into small squares. Heat 1 tsp oil in a kadai (non–stick is better), add the cubed Brinjal, salt and stir fry/ roast for some time. The brinjal cubes should not be mashed but firm and cooked. Transfer the cubes to a plate. In the same pan, pour 1 tbsp oil and sauté the chopped onions. Once they are transparent, add ginger garlic paste and sauté. Add all the spices and the chopped tomatoes. (I added 1 medium tomato and few cherry tomatoes). Sauté for just one minute after adding tomatoes (it should not be smashed) and add the roasted Brinjal pieces to it. Stir fry for another minute and turn off the flame. Mix chopped coriander leaves and serve hot with phulkas or rotis. No water is required while cooking. Only stir frying is required as the Brinjal cooks easily. Tomatoes should not be smashed too much, add the Brinjal cubes and stir fry. Cumin Powder should be a pinch or just ¼ tsp or it will be overpowering. It is a good source of dietary fibre and minerals like manganese, copper and potassium. It is also a good source of Vitamin B1 (thiamin), Vitamin B6, folate, magnesium and niacin. The water content found in eggplants help keep your skin soft and supple and the minerals and vitamins keep your system clean and healthy to give you flawless skin. Serve hot with Rotis/ Chappathis or Phulka. Enjoy! God Bless! !